A poll conducted by P2P-Kredite.com among seasoned German speaking investors found, that many prefer p2p lending platforms outside the country they live in. After getting accustomed to the p2p lending concept and liking it, they are on a hunt for higher yields. Further supporting factors are the offered English language interface (a language most understand well), the easy transfer of funds within the Eurozone by SEPA payments and more features offered, e.g. most foreign platforms offer a secondary market, while currently none of the German marketplaces do. Poll by P2P-Kredite.com, conducted in June 2016. 60 respondents. Each respondent could name up to 6 platforms. Note that Funding Circle refers to the German platform of Funding Circle, not Funding Circle UK. 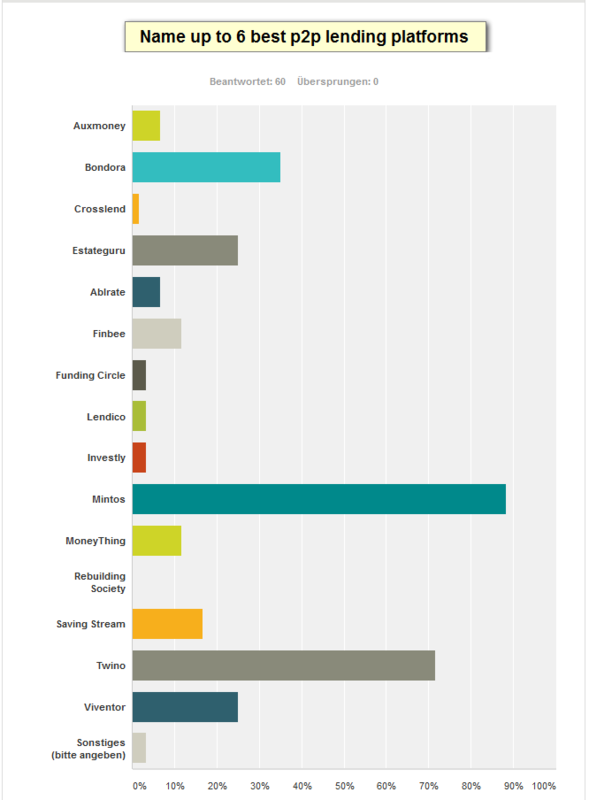 Mintos (53 votes) and Twino (43 votes) lead by a wide margin in preference of the respondents, followed then by Bondora (21), Estateguru (15), Viventor (15), Saving Stream (10), Moneything (7) and Finbee (7). Exclusively baltic and british platforms rank best among the respondents. The choice of british platforms for German investors is limited though as some like Zopa or Ratesetter are open only to UK residents or require a UK bank account to sign up. Nearly all votes were cast before the Brexit decision. It remains to be seen how the UK platforms will rank in German investor preference in the future, given the more volatile GBP/EUR rates and the increased uncertainty for the UK economy.